These are the stockings I started way back in August. The knitting was done in September but ever since they have been waiting to have the ends woven in. Four ends and two months. A job that takes about 5 minutes ends up taking two months. These are from Austermann Step with 2 mm needles. The feel of the yarn is very nice and I do like the striping here as well. The stockings don't match and I did not try to do it either. Although it would have been easy and there is plenty of yarn left out of 200 grams. It was difficult to get good pictures. It did not help that the model was in a hurry to catch a bus to school and there was no day light at the time. We even had an assistant. I have finished another pair, same yarn but different colorway but as pleasing to the eye as the first pair. These are not knee highs but just ordinary socks. Casino Shawl is still very small, less than two pattern repeats. The pattern suggested 4 mm needle size but I changed it to 3½ mm and added two pattern repeats to get a big shawl so I'm slowly reaching the point of 300 stitches per row. The only thing that bothers me is the yarn... actually it is not the yarn, but my hands. Country life in the winter is not good for your hands, they turn into cracked and rough and handling silk... not so nice. But I'll try because Casino shawl has a deadline, December 6th. When I spent a lot of time outdoors gardening, the advice was to mix olive oil and salt or sugar, then rub your hands as if washing after a bath - the skin is gently scoured and the oil traps moisture. Lovely socks, lucky daughter. I'm looking forward to knitting up my skein of Austerman Step. After I gave my ball away in a swap, I got another ball for a birthday present, and in a color I like better! It was meant to be. I chuckle at your observation that the job which takes five minutes ends up taking two months - how true! They look great! When I make a pair I want to wear them right away. I have so few yet that they will not hang around waiting to be finished. My needles need to be busy, as I have already worn holes in some of my handknit socks from overwearing them. i use an exfoliating scrub on my face, and always make sure to rub my hands with the excess—then shea butter creme right afterwards. this has helped my very dry hands immensely. can't wait tos ee casino! can you tell us what is special about dec 6 (besides st. nicholas day)? Mix about 1/4 c of oil, I use grapeseed oil - it's good for the circulation, 1/4 c sugar - which when broken down helps collagen, and a few drops of orange oil for an uplifting scent. My daughter, who is studying to be a nutritionist, says aloe vera is also very good for the hands, as well as helping with any artheritic problems. Lovely socks! I have heard the Step yarn can be slippery when walking on wood floor, what does your daughter think? Lene, I love how the lighting in these photos looks so warm and cozy and inviting. You must have very very steady hands (or a tripod? or a camera that eliminates hand-shake?) to get such crisp photos in low light. Deliciouso! The socks are just beautiful! Your knitting is so even and the colorway is gorgeous. Thank you for sharing! Another good suggestion for dry skin is hydrolated petrolatum. It's like an opaque white petroleum jelly with water trapped inside. My son's dermatologist recommended it for chronically dry skin, and it works better than anything else we've tried. For the best results, put it on your hands after they've been in water (after a shower or doing dishes). It's not nearly as greasy as petroleum jelly, but it will work wonders on your skin. I got it from our local pharmacy--we didn't need a prescription, but it had to be special ordered because there isn't a huge demand for it. Try it! I love the striping in those socks. Was that the yarn with the aloe in it? The stockings look great. My hands have the same problem, it gets so dry here in Colorado during the winter, and my skin gets dry, rough and cracks. Knitting with silk or any lace weight is always a challenge. Those socks are beautiful. Anxious to see Casino Shawl! Looking forward to seeing more of Casino Shawl, my Dad's birthday was Dec. 6, I still bake a strawberry pie in his honour. Good luck on the shawl & I know what you mean by "dry" hands in cold months. I live in FL, but in the cooler months, there's a huge difference or if I don't wear gloves when cleaning. Every fiber snags on the hands. Your socks are fabulous! Great socks! Is this your own pattern? Will you share it? Sometimes I take forever to finish a project too. I hate seaming and kitchenering. I love those socks! You might have mentionned this with other socks but do you knit them top down? And what size needles to you regularly use (with regular sock yarn I mean)? Your socks are always so beautiful! Kudos to your sock model - I think she has a future in it! They look so warm and cosy. The colours of your Austerman Step are lovely, like coffee with cream. 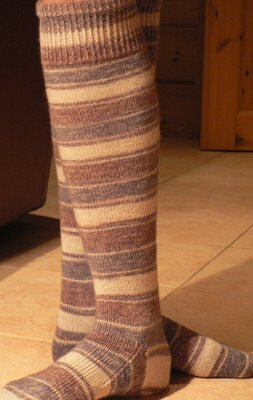 I just finished making a pair of Austerman socks for my husband (his first hand made pair.) I should say, almost hand made as I used my circular sock knitting machine. I loved the feel of the yarn, but it was a bit slippery for the machine, and kept popping off the needles.Did your yarn have the jojoba oil and aloe vera? The knee socks are beautiful! I work hard to always get my socks to match but yours look terrific together and are more visually interesting. Wonderful, cosy socks. Take care of your poor cracked hands. Love these striped kneesocks!! What pattern did you use? Lovely socks, I hope they do good for sore feet. Beautiful socks! Lene, what are the colour numbers of your two Austermann yarns? Those socks look so so comfy, just the kind of thing to curl up on the sofa with. The socks are beautiful. Being photographed with lamp light makes them seem even more cozy, as if it is evening and someone is wearing them to be warm after a long day. I don't know how it is to have sun for only 6 hours a day, but it does seem like a fair amount of knitting would get done. I meant to comment after you finished Katariina, but time slipped away from me. She is beautiful, a I would imagine quite warm. 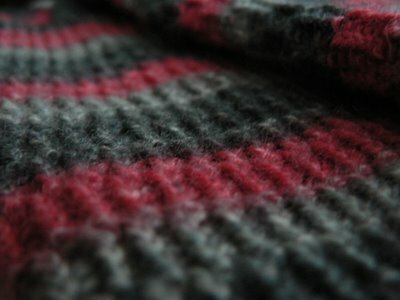 Thank you for sharing your technique, twined knitting. Most of all I wanted to thank you for telling us that once you finish you don't really want to see that piece for a while and that you feel like you are done knitting. I thought I was some kind of failed knitter for feeling this way. Knowing that you feel this way has eased a burden for me and now I might actually try knitting a sweater for myself. You've inspired me to buy some Austermann and do some knee-highs. You've got such consitently neat gauge though unlike me...hard act to follow! I hope you are okay--it has been such a long time(9 days) since your last post. You have no idea how much you're missed!